Sea Life - Steller Sea Lion - Eumetopias Jubatus, British Columbia. I took this picture of these sea lions basking in the sun and enjoying the sea life! The waters were flat calm in this small groups of islands and the sun was shining. The sea lions use coastal islands and rock ledges for breeding, and staying safe from predators. It is often difficult to spot these sea creatures because they normally blend in well with the rocks. This picture shows what could be one harem. 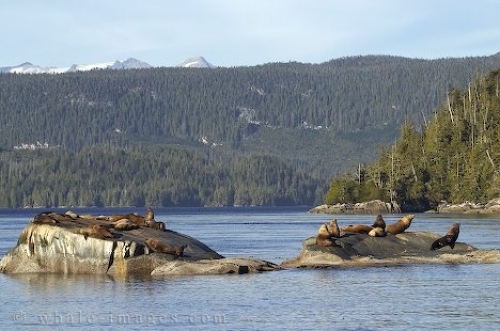 Picture of two rocks filled with Sea Life, Sea Lions on the British Columbia coast.